Direct investments (DI) fell 5.7% yoy to US$12.5bn in 3Q18 due to a deeper contraction in foreign direct investments (FDI) of 20.2% yoy to US$6.6bn. DI in manufacturing sector was the key laggard. DI in utilities, transportation and construction were supported by government’s national strategic projects. 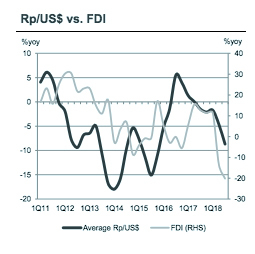 Falling FDI, softer exports and volatile portfolio flows put a greater burden on reducing imports to lower current account deficit and ease rupiah weakness. 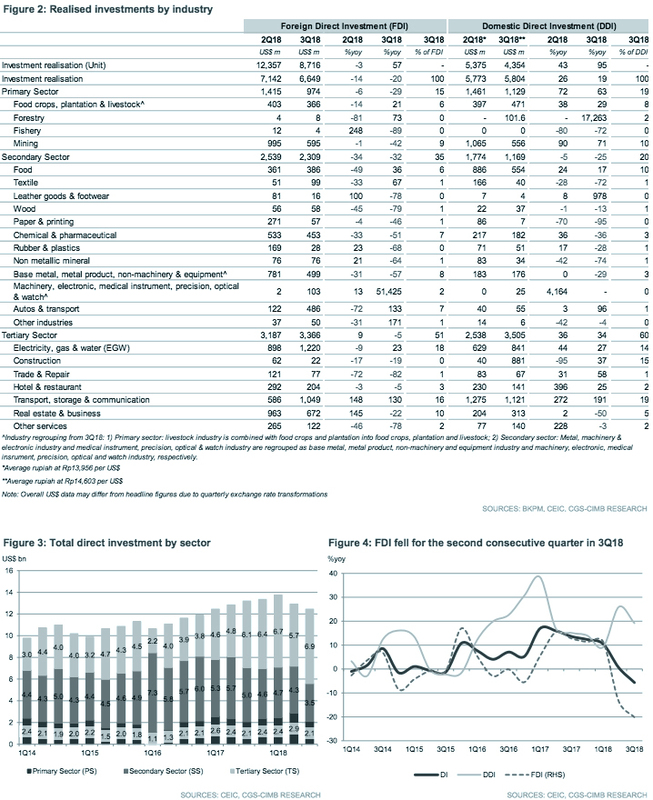 Total direct investments (DI), which exclude the O&G and banking sectors, declined by 5.7% yoy/3.6% qoq to US$12.5bn in 3Q18 due to a sharper contraction in foreign direct investments (FDI) by 20.2% yoy to US$6.6bn, the lowest level since 4Q12 (-13.5% yoy to US$7.1bn in 2Q18). Domestic direct investments (DDI) rose by 19.2% yoy to US$5.8bn in 3Q18 (+25.9% yoy to US$5.8bn in 2Q18). Investment in mining industry took a backseat (-15% yoy in 3Q18 vs. -32% yoy in 2Q18) following record-high capital outlays exceeding US$2bn in 2Q18. Investments in the manufacturing sector (-30% yoy in 3Q18 vs. -24% yoy in 2Q18) were dragged lower by the non-metallic mineral, rubber & plastics, chemical & pharmaceutical, paper & printing, wood and apparels industries. Investment in the tertiary sector (+12% yoy vs. +20% yoy in 2Q18) continued to be supported by the government’s national strategic projects in transport, storage & communications (+158% yoy), construction (+35% yoy), as well as electricity, gas and water supply (+25% yoy) industries. External uncertainties and rupiah volatility dampened FDI from Singapore (-33%), China (-38% yoy), US (-38% yoy) and South Korea (-53% yoy), which collectively accounted for 41% of FDI in 3Q18. FDI from Japan (+18% yoy), Hong Kong (+55% yoy) and Malaysia (+132% yoy) increased. Declining FDI implies a shortage of stable, long-term sources of financing to fund the country’s current account deficit (CAD). Furthermore, it increases the country’s reliance on portfolio flows to bridge the savings-investment gap at a time of tightening global trade and liquidity conditions, and is a continuing source of pressure on the rupiah, which plays a shock absorber during periods of external funding shortfalls. To ease the pressure on the rupiah, the government has introduced several import-reduction measures to curb the CAD, with the postponement of import-intensive projects among the more effective, in our view. 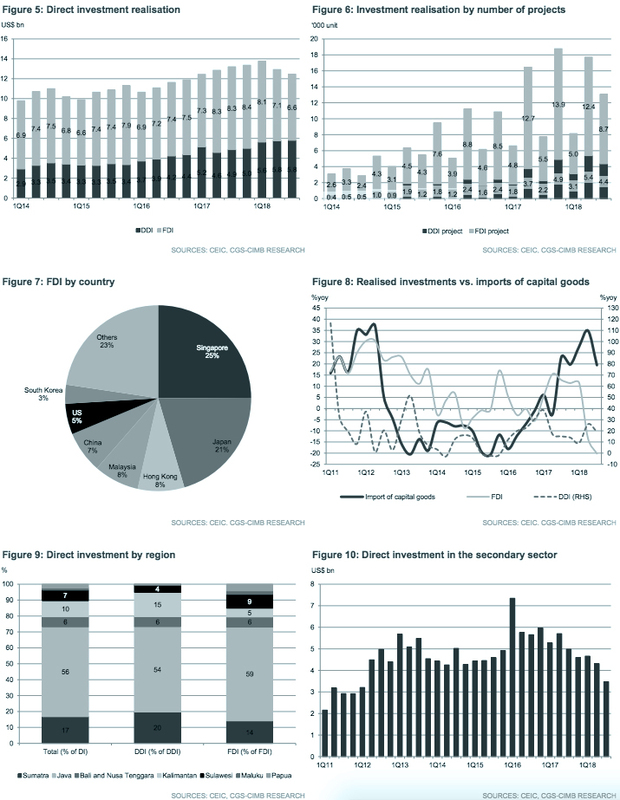 Falling direct investments and the project delays present some downside risk to the growth outlook. We expect real GDP to expand 5.2% yoy in 3Q18. Originally published by CIMB Research and Economics on 31 October 2018.